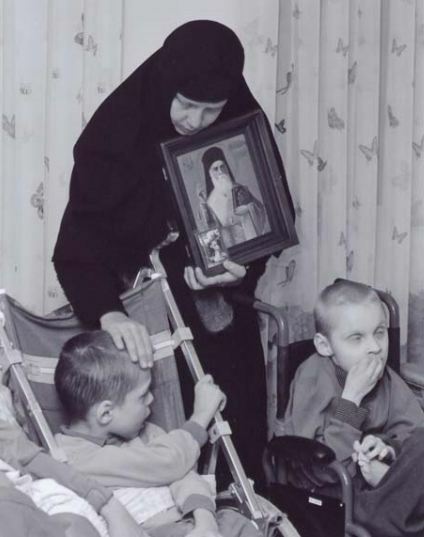 Nun taking care of disabled children (St. Elizabeth Convent, Minsk). A person should have a more attentive attitude toward his brother’s flesh than toward his own. Christian love teaches us to give our brother not only material but also spiritual gifts. We must give him our last shirt and our last crust of bread. Here personal charity is as necessary and justified as the broadest social work. In this sense there is no doubt that the Christian is called to social work. He is called to organize a better life for the workers, to provide for the old, to build hospitals, care for the children, fight against exploitation, injustice, want, lawlessness. In principle the value is completely the same, whether he acts on an individual or social level; what matters is that his social work be based on love for his neighbour and not have any latent career or material purposes. For the rest it is always justified- from personal aid to working on a national scale, from concrete attention to an individual person to an understanding of abstract system for the correct organization of social life. The love of man demands one thing from us in this area: ascetic ministry to his material needs, attentive and responsible work, a sober and unsentimental awareness of our strength and of its true usefulness. Mother Maria Skobtsova, Essential Writings. After having a really heated debate on another blog over the issue of whether we should have social welfare programs as well as private charity, it’s nice to see this quote. A lot of American Orthodox have brought with them into the church the idea that government is bad, and that only private charity bespeaks of personal virtues. Thank you for posting this.